2010 Chinese Gold Pandas are available now. 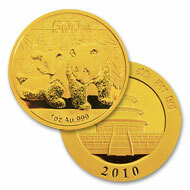 These 2010 Gold Pandas are struck in one-tenth and one full Troy ounce of 99.9% gold. Ever since 1982 Pandas have been immensely popular not only in China, but worldwide.